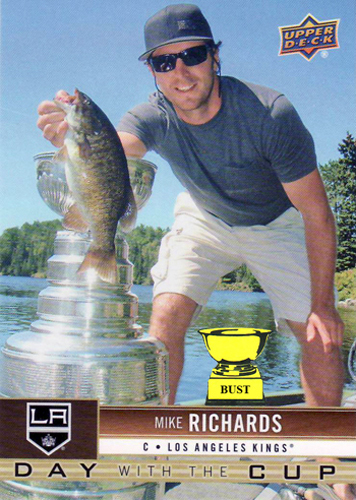 Here's how Mike Richards spent his day with Lord Stanley's Cup: Richards woke up before the sun rose, put on the standard frat boy uniform and drove to the river, with the Cup riding shotgun. He loaded the trophy into his boat, the Puck Bunny, and steered toward his favorite fishing hole. He cast into the deep blue and pulled up a fish. Then another. And another. And another. At the end of the day, with a haul of 48 bass, he headed back to the pier, where he spent two hours cleaning his bounty, tossing the guts into the Cup. He packed up and headed home, dropping the Cup off with the NHL, fish guts included.